The station numbers increase from west to east or south to north based on the cardinal direction of the overall pipeline. For pipeline projects, a starting reference station is first established; then all distances along the route centerline are measured from that point location. 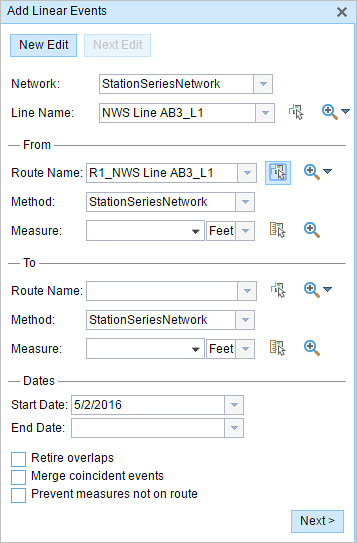 You can add event data to routes by entering station numbers in the Line Events tool interface. The station data is translated to routes and measures for storage. Create a starting or base station on the route and enter the station values as an offset from that station. Identify a starting or base station on the route and enter the station values as an offset from that location. 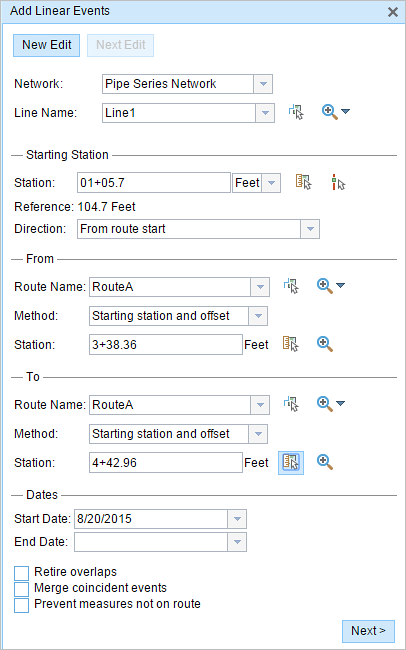 Use the preexisting stations on the route to calculate or enter the measures in the form of station values. You can use this method when you want to enter the measures using an offset distance from a selected station on the route. 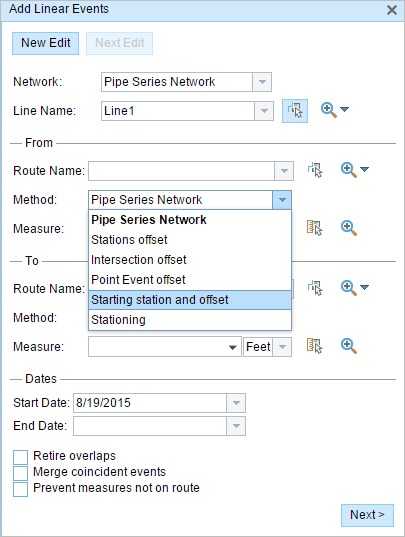 This functionality is available only for an LRS Network that contains a Stationing event layer. In the following example, a starting station (yellow dot) is temporarily located with a station value. 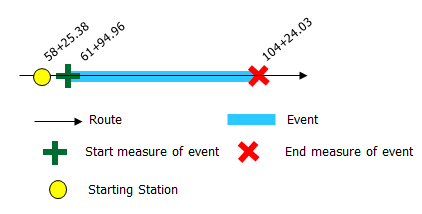 The event's start or end location is then identified by using an offset distance (in station values) from the starting or base station. When new linear events are created using this method, the stationing data is translated to routes and measures for storage. Click the Network drop-down arrow and choose the network that will serve as a source LRM for defining the input measures for the new events. 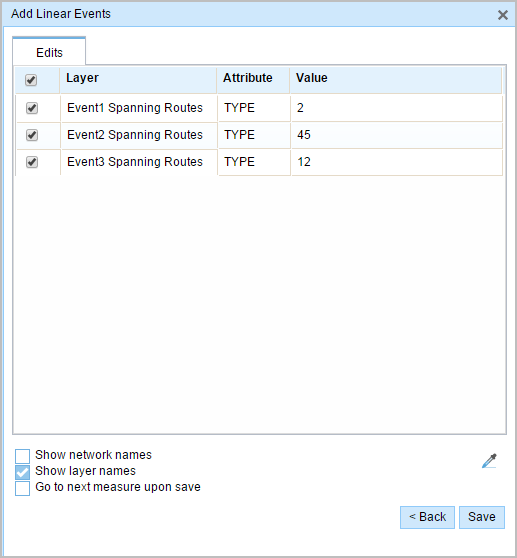 The Network is an LRS Network published as a layer in the Event Editor. You can specify the LRS Network to be used as the LRM for defining the measure of the new point event. The widget accepts an LRS Network as a source to identify the location for adding the new point event. 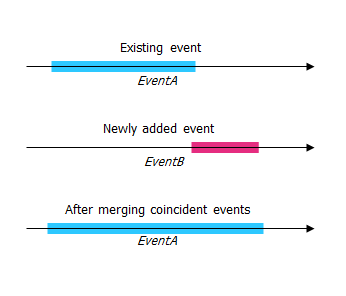 However, when the new point event data is being stored in the database, the application performs an internal translation of measures to always store the measure value in the linear referencing method of the LRS Network with which the event is registered. In the From section, click the Method drop-down arrow and click Starting station and offset. The Starting Station section appears. In the Starting Station section, for Station, click the Select a Location on the Map tool and choose one of the existing stations as the starting station on a route on the map. A yellow dot shows the location of the starting station on the route on the map. The Station, Units, and Direction values for the selected station are automatically populated. The LRM measure equivalent of the selected location is displayed in the Location field. For example, if the LRM is milepoint, the number of miles at that location will be displayed. The Route Name text box in the From section is automatically populated. Click the Select a Location on the Map tool and click a location on the selected route. The station number is derived from the route. The start measure location will be placed at an offset from the starting station. A green plus appears at the selected location on the map. In this example, the same starting station is used to derive the To Measure value. A red x appears at the selected location on the map. Provide the attribute information for the new event in the tables defined by attribute sets. 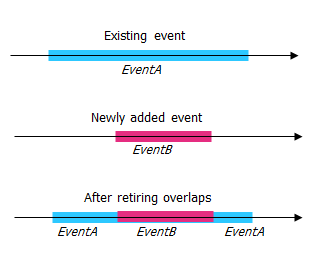 You can use the Copy Attribute Values tool to copy event attributes from another route. Click the tool and click a route on the map to copy the event attributes. Event Editor (EE) uses a default attribute set, as seen on the Edit tab. You can modify the attribute set to create custom attribute sets or use the administrator-configured attribute set.